mmediately on returning to Dayton, Wilbur wrote ten engine manufacturers, giving them his specifications for an airplane engine. He needed an gasoline motor that would weigh no more than 180 pounds and deliver at least 8 horsepower. While waiting for a reply, the brothers turned to making the propellers. As was their habit when tackling a thorny engineering problem, they first searched the literature for research on propeller design -- and found nothing! So they began to think it through themselves. Their first insight set them on the right track. "It was apparent," Orville wrote later, "that a propeller was simply an aeroplane [wing] traveling in a spiral course." That meant that the research they had already done on wing design could be applied to propellers. But it wasn't quite that simple. 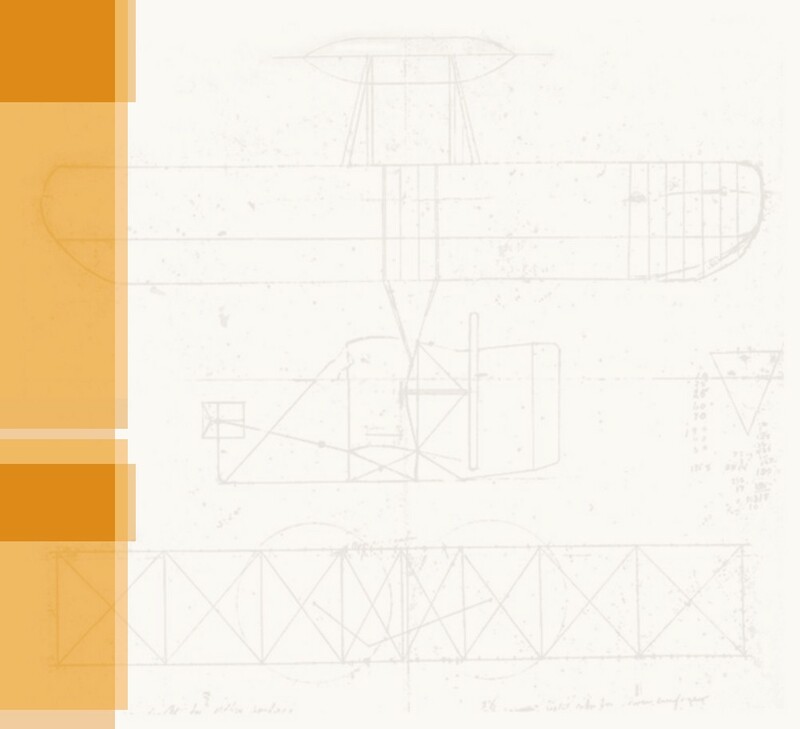 Wrote Orville, "With the machine moving forward, the air flying backward, the propeller turning sideways, and nothing standing still, it seemed impossible to find a starting point from which to trace the various simultaneous reactions. Contemplation of it was confusing. After long arguments, we found ourselves in the ludicrous position of having been converted to the other's side, with no more agreement than when the discussion began." Charlie Taylor later recalled these arguments. "Both boys had tempers. They would shout at one another something terrible. I don't think they ever got mad, but they sure got awfully hot." To make matters worse, there was no engine available that fit Wilbur's specs, and no company that was willing to develop one. So the Wrights, along with Charlie Taylor, waded into the the unfamiliar territory of gasoline engine design. "We didn't make any drawings," Charlie remembered. "One of us would sketch out the part we were talking about on a piece of scratch paper and I'd tack the sketch over my bench." Nonetheless, they built the engine in six weeks. They ran it up for the first time in February. On the second day of tests the bearings froze, and they had to start all over. But Charlie had the rebuilt engine running smoothly in May, in plenty of time for the 1903 flying season. They settled their differences on propellers, too. Using a hatchet and a draw knife, Wilbur and Orville hand-carved two 8-1/2-foot-long propellers from laminated spruce, and covered the tips with canvas to keep the wood from splitting. When tested, the propellers were 66 percent efficient, converting two-thirds of the energy applied to them to thrust. This was within 1 percent of what the brothers had predicted, using the formulas that they had argued long and hard over. The airplane on which they would hang the engine and propellers was the largest they had ever built, 40 feet from wingtip to wingtip. Orville referred to it as the "whopper flying machine." It was so large, in fact, that they never fully assembled it in Dayton. They just packed up the parts for shipment. On September 23, 1903, Wilbur, Orville, and their whopper flying machine left for Kitty Hawk. 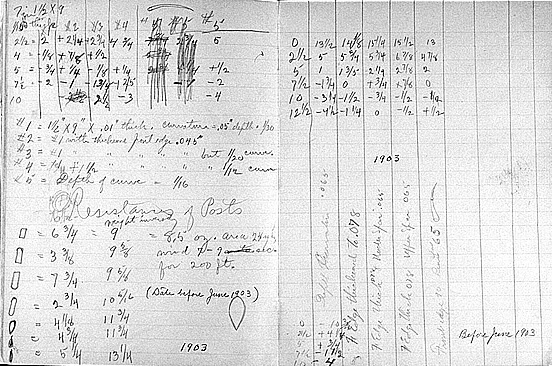 Some of the many calculations that Orville and Wilbur made to design efficient propellers. The end result of all their calculation was the first truly modern propeller. 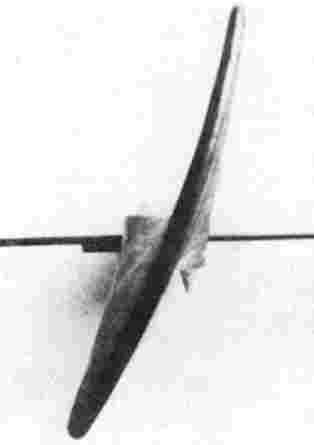 The end view of a 1903 propeller shows how the blade was curved like a wing. The 1903 Wright engine, viewed from the side. 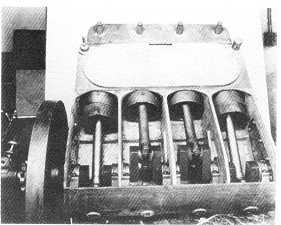 The four combustion chambers would glow red hot when the engine was running. An inside view of the engine. 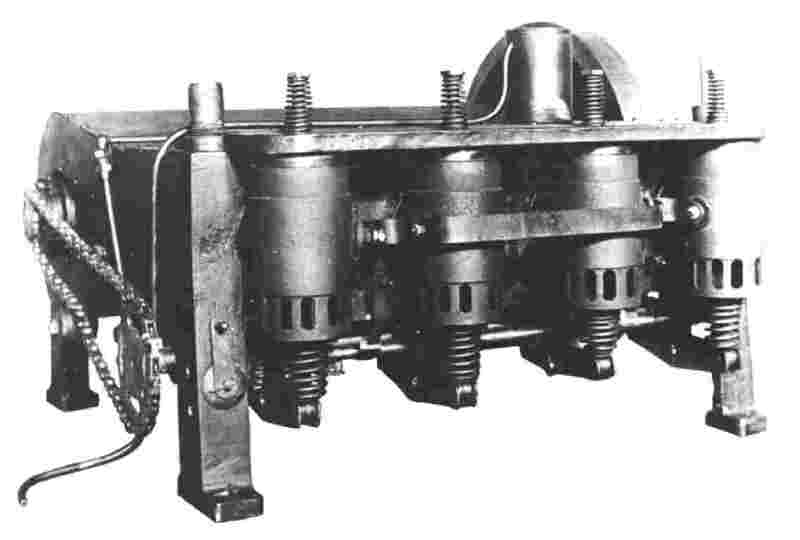 The Wrights elected to make a "horizontal" engine because that's what they could machine on their limited metalworking tools.